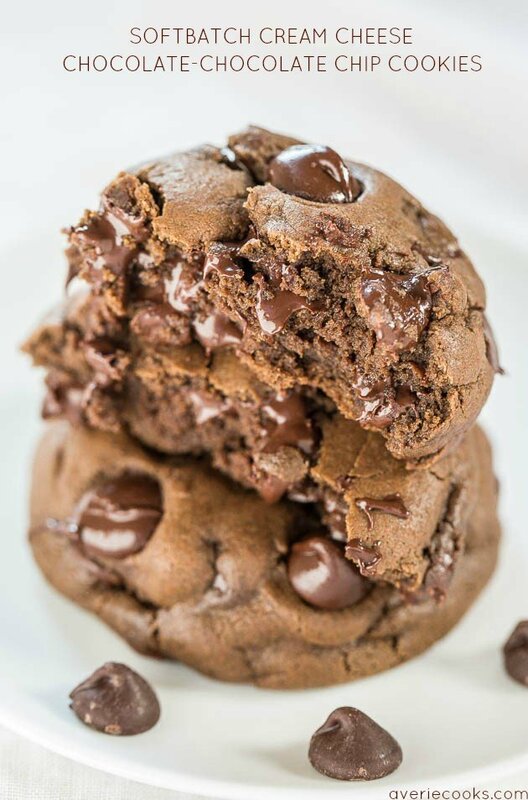 There are chocolate chips and cocoa powder in the cookie dough and they’re topped with a rich, creamy, fudgy chocolate ganache. It’s what a chocaholic’s dreams are made of. The cookies are slightly chewy around the edges with super soft with tender, pillowy centers. 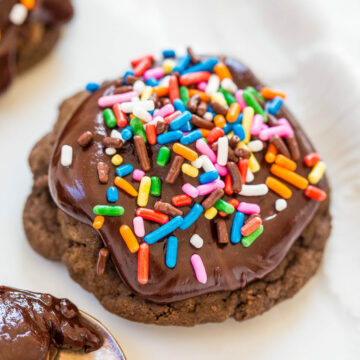 The dough base is adapted from Soft Frosted Chocolate-Chocolate Chip Sprinkles Cookies and recently I made Peppermint Patty Chocolate Cookies with this dough. It’s my current favorite all chocolate cookie dough base. There are two tablespoons of cream (or half-and-half) in the dough which makes the cookies creamy and moist but also makes for a very soft dough so it must be chilled before baking. 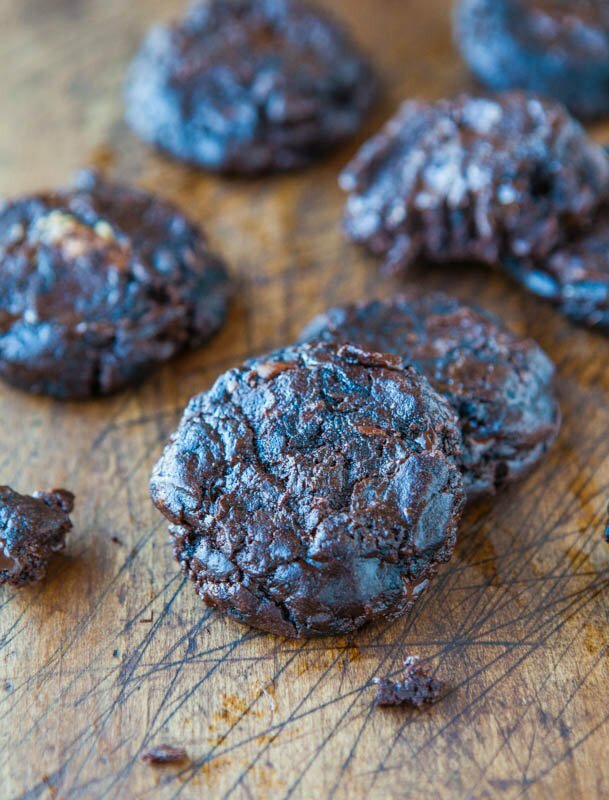 The cream also helps combat dryness which can plague chocolate cookies because of the drying effects of cocoa powder. 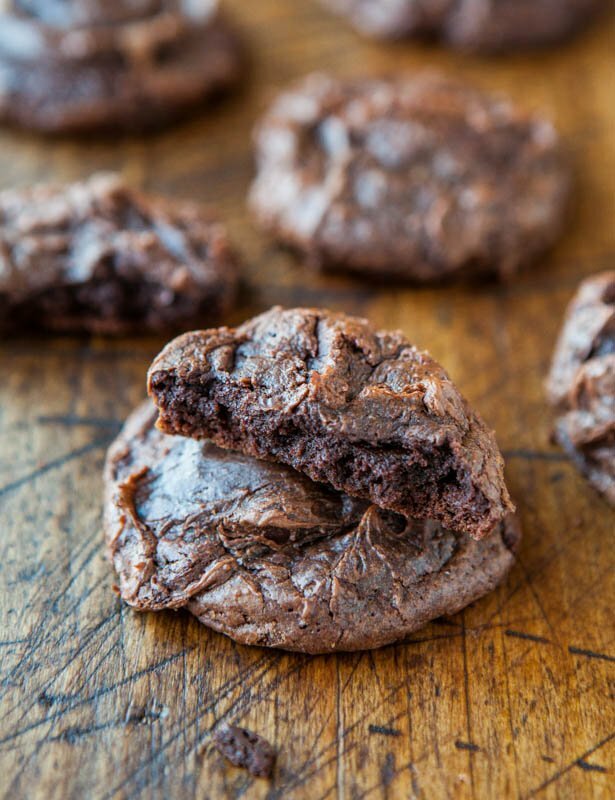 Make sure not to overbake and you’ll be rewarded with a chocolate lover’s delight. If you’ve never made ganache before, it’s ridiculously easy and sounds much fancier and trickier than it really is. All you have to do is heat cream or half-and-half and pour it over chocolate chips. The secret is being patient and letting time do the work for you. The warm cream softens the chips and in about 10 minutes you can whisk the mixture smooth. The ganache is soft but not runny at room temp and hardens up more in the fridge. It’s the perfect ‘sand trap’ for lots of sprinkles. Switch up the color of the sprinkles depending on the season such as red/green for Christmas, pastel for spring and Easter, orange/black for the fall and Halloween, etc. 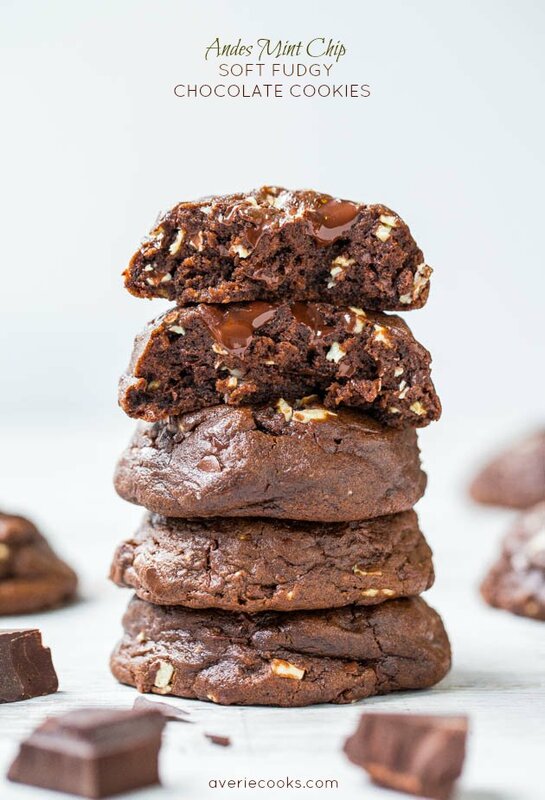 There are chocolate chips and cocoa powder in the cookie dough and the cookies topped with a rich, cream, fudgy chocolate ganache. There are two tablespoons of cream in the dough which makes the cookies creamy and moist but also makes for a very soft dough so it must be chilled before baking. The cream also helps combat dryness which can plague chocolate cookies because of the drying effects of cocoa powder. Make sure not to overbake. 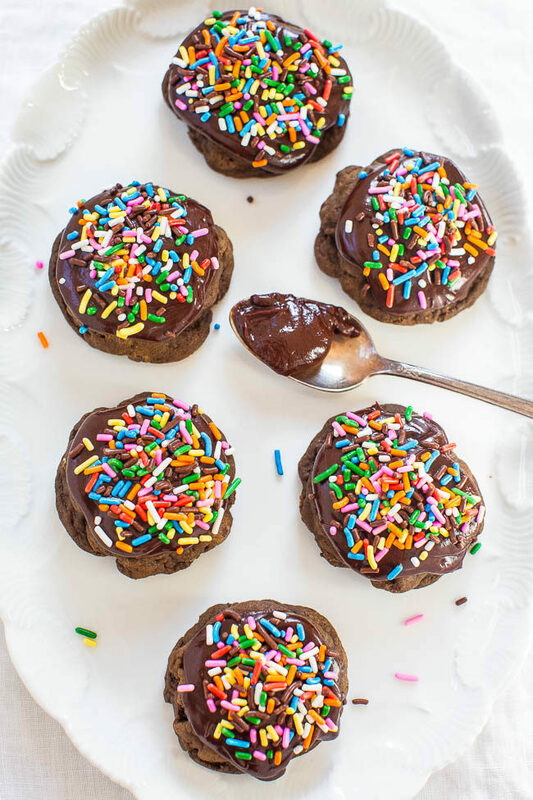 The ganache is easy and perfectly traps the sprinkles. Cookies – To the bowl of a stand mixer fitted with the paddle attachment (or large bowl and electric mixer), add the butter, sugars, and beat on medium-high speed until creamed and well combined, about 3 to 4 minutes. Stop, scrape down the sides of the bowl, and add the egg, vanilla, and beat on medium-high speed until well combined, about 2 minutes. Stop, scrape down the sides of the bowl, and add the cream, and beat on medium-high speed until well combined, about 1 minute. The batter may look a little ‘grainy’ and almost as if it’s separated, this is okay. Stop, scrape down the sides of the bowl, and add the flour, cocoa powder, baking soda, salt, and beat on low speed until just combined, about 1 minute. Using a 2-tablespoon cookie scoop or your hands, form approximately 19 equal-sized mounds of dough. The dough is very soft and I find it easiest to use a cookie scoop. Flatten the dough mounds about halfway, place on a baking sheet, spaced at least 2 inches apart (I bake 8 cookies per sheet) and bake for about 8 to 10 minutes or until edges have set and tops are just set, even if slightly undercooked and glossy in the center; don’t overbake. Cookies firm up as they cool. Allow cookies to cool on baking sheet completely. I let them cool on the baking sheet and don’t use a rack. While they cool, make the ganache. Ganache – To a medium bowl, add the chocolate chips; set aside. To a microwave-safe measuring cup or bowl, add the cream and heat on high power until just boiling, probably about 30 seconds, but watch it closely because all microwaves vary. Pour the warm cream over the chocolate chips, cover with plasticwrap or foil to trap in the heat, and let it rest for about 10 minutes. After about 10 minutes, whisk the mixture smooth. Tip – If your chips are resistant to melting, you can place the bowl in the microwave and heat for about 15 to 30 seconds. 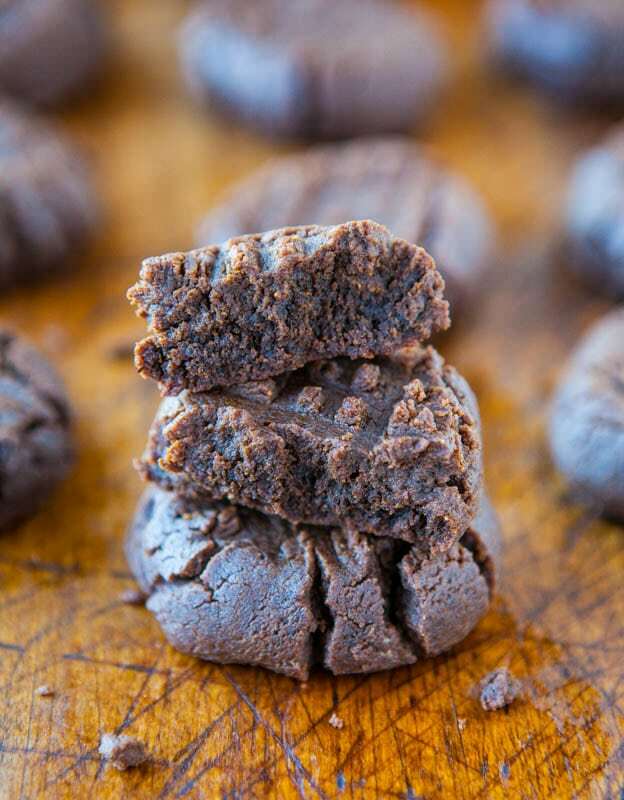 Add about 1 to 2 tablespoons ganache to the top of each cookie. 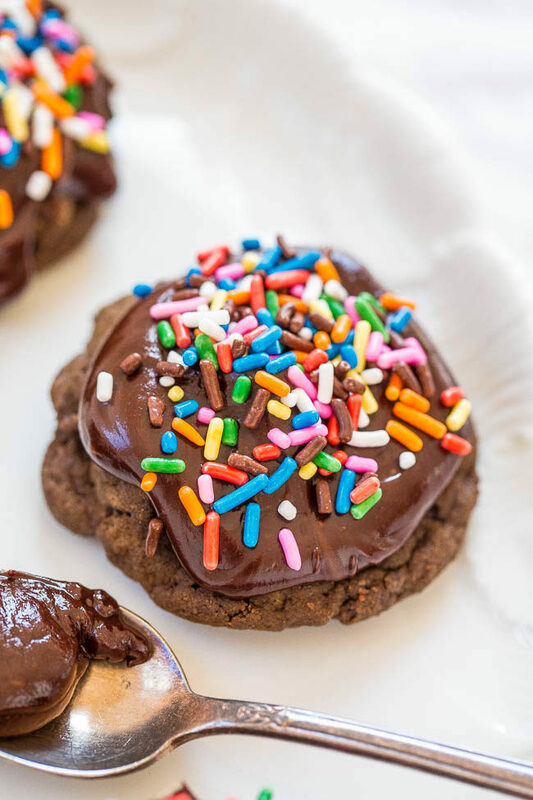 Evenly sprinkle each cookie with as many sprinkles as desired. Cookies will keep airtight at room temp for up to 5 days or in the fridge for up to 1 week. I’m comfortable storing items with ganache at room temp but if you’re not, store in the fridge, noting cookies will dry out more in the fridge. Unbaked dough can be stored airtight in the refrigerator for up to 5 days, or in the freezer for up to 4 months, so consider baking only as many cookies as desired and save the remaining dough to be baked in the future when desired. 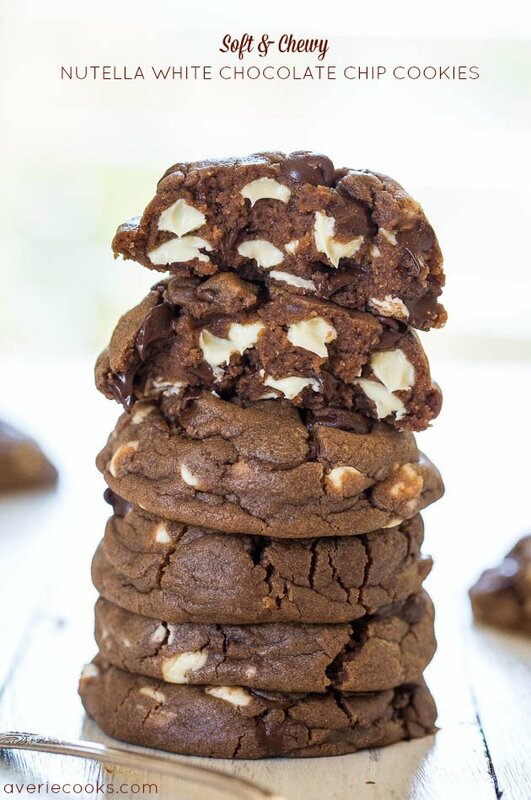 Peppermint Patty Chocolate Cookies – Very chocolaty, ultra fudgy, and loaded with chocolate chips and peppermint patties!! If you love mint + chocolate, you’ll adore these easy, soft, and decadent chocolate bombs! Soft Frosted Chocolate-Chocolate Chip Sprinkles Cookies – Soft, chewy, very chocolaty cookies topped with tangy cream cheese frosting! A match made in heaven! Everything’s better with sprinkles! 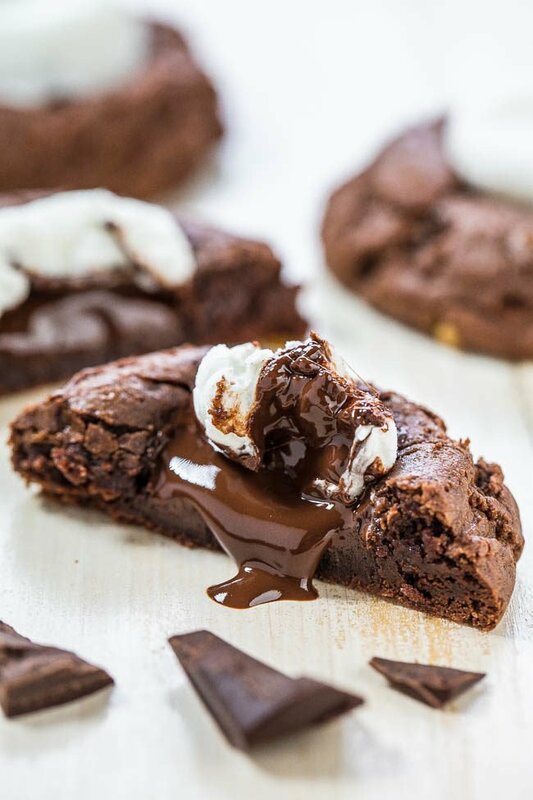 Hot Chocolate Cookies – Rich chocolate cookies topped with a hunk of melted dark chocolate and toasted marshmallows! Best ‘hot chocolate’ you’ll ever have! 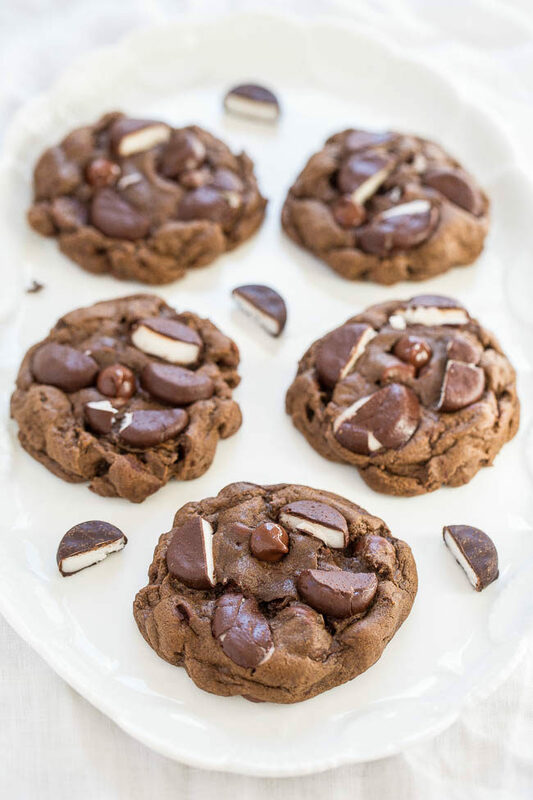 Softbatch Cream Cheese Chocolate-Chocolate Chip Cookies – Cream cheese keeps them super soft! 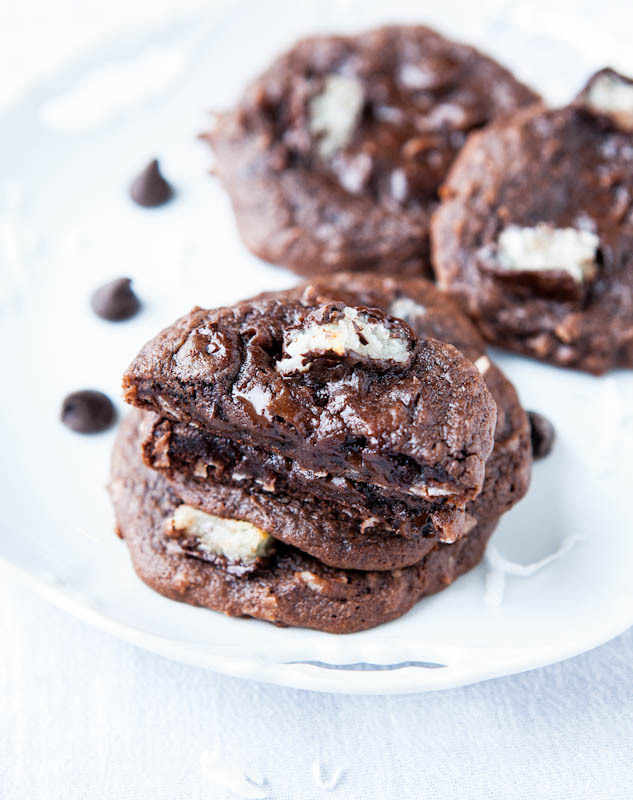 Say hello to one amazing chocolate cookie! 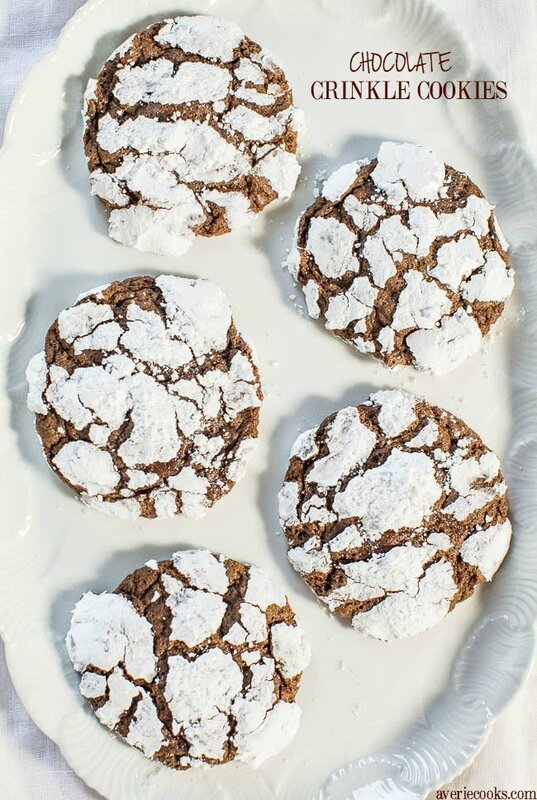 Chocolate Crinkle Cookies – Soft, ultra fudgy and there’s NO butter and NO mixer needed! 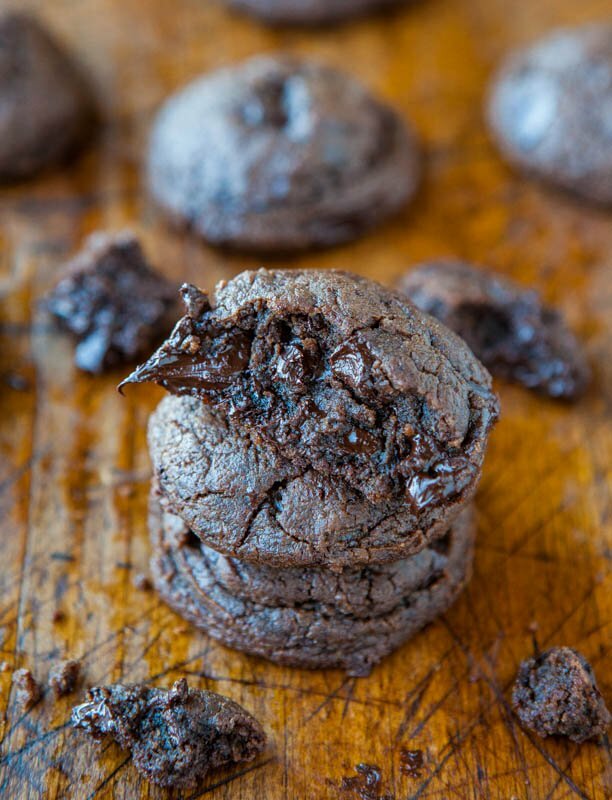 So easy and the crinkles make them irresistible! 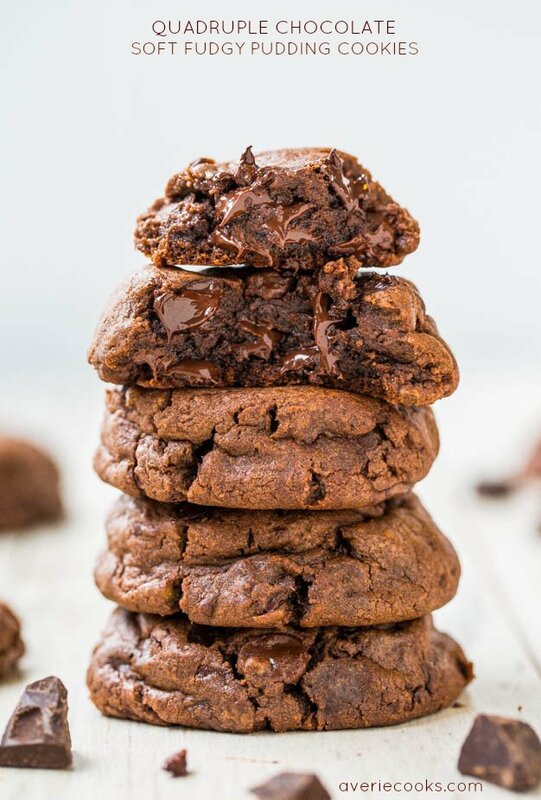 Quintuple Chocolate Fudgy Brownie Cookies – For the ultimate chocolate lover, there’s chocolate five times: Cocoa powder, melted bittersweet baking chocolate, semi-sweet chocolate chips, diced chocolate and caramel-filled truffles, and chocolate-filled Oreos! 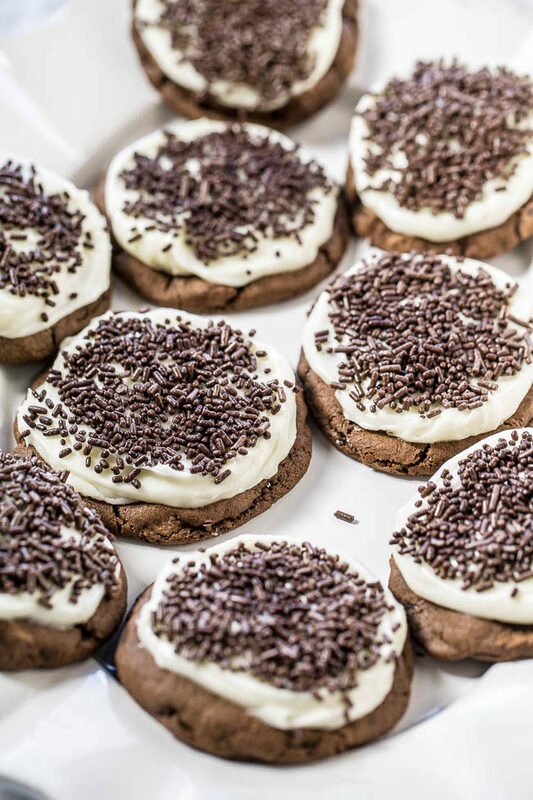 I think the frosting is really getting my attention in these cookies! I love a good buttercream but ganache is probably my favorite because of its close relationship to fudge!! Oooo! These cookies sure look incredible! I could eat a dozen! :D Happy New Year, Averie! My boys will love these cookies! Happy New Year! Yummy!! 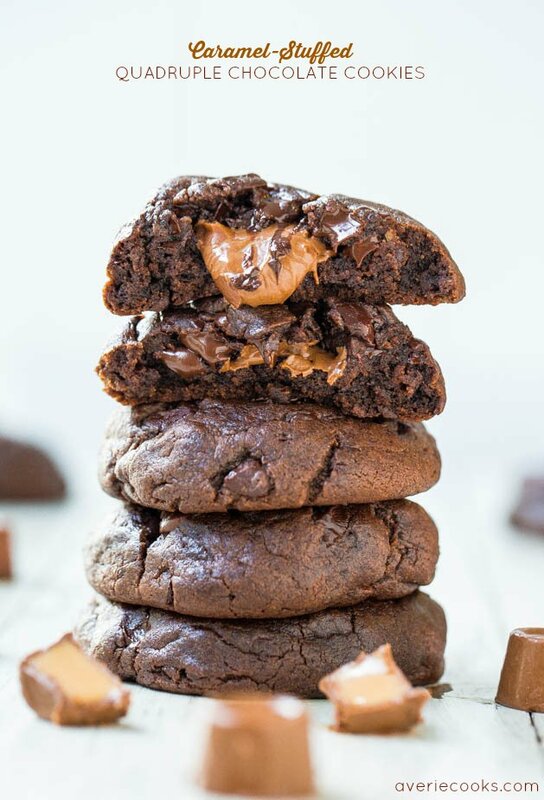 These cookies look heavenly and I can’t wait to try them! Thanks for sharing the recipe, Averie! Do you think scooping the chilled dough from a bowl directly onto the cookie sheeet then baking immediately would work as well? Our small fridge doesn’t have oodles of space to begin with so popping a cookie sheet with dough atop may only be possible once in a great while, such as right before a major grocery run. Ganache is a weakness here so I had to ask. These look SO GOOD! You can get the dough into the fridge any way you wish. I use a platter (not nearly as large as a cookie sheet) for space saving as well. hey girl – this looks so yummy! Death by chocolate – these are what my dreams are made of! I would love a plate of these with a big glass of ice cold milk!! And those sprankles add a fun pop of color. Happy New Year Averie!! Happy New Year to you too! Ice cold milk or even…red wine :) would be good I bet! 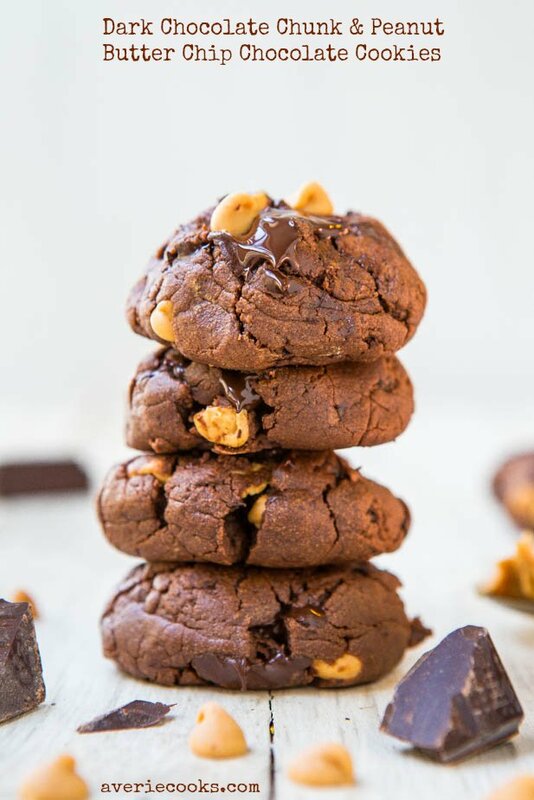 I LOOOOVE ganache and these cookies look next level decadent!